Artist John Singer Sargent (1856-1925) was a highly regarded London-society portrait painter in the period that Percy Grainger was establishing his international career as a concert pianist in the first decades of the twentieth century. Sargent became a prominent patron of Grainger, regularly inviting the young Australian to perform in ‘At Home’ engagements at Sargent’s London residence early in their friendship. It was largely through Sargent’s influence that Grainger was able to make a living as a society pianist. Grainger and Sargent were often together, and evidently enjoyed each other’s company. Grainger wrote once that “we have good laughs”1 and described Sargent as a “kindredley-seeing mind...”. 2 Sargent and Grainger were part of the party of guests of Lady Elcho at her country home Stanway in Gloucestershire, in 1907 and 1908, while Grainger undertook his folksong collecting in the region. Sargent made a charcoal sketch of Grainger in late March/early April 1908. Grainger was delighted by the image, noting in a letter to Karen Holten that “Sargent’s drawing is quite excellent”.3 By July 1908 he had reproductions made of the drawing to take on his tour to Australia with opera singer Ada Crossley. While on tour, these were used for promotion in various high profile venues: in Melbourne, for example, they were placed in Allens music shop in Collins Street, and in Adelaide, they were displayed at James Marshall & Co (later Myers) Emporium, the largest business of its kind in South Australia. Copies of Sargent’s portrait in various formats appear everywhere in the Grainger Museum Collection: on postcards, promotional posters, performance programs, and in newspaper clippings from around the world. Grainger also made large copies of the work, and inscribed them personally to a number of friends. The version illustrated here was dedicated to his close friend and medical doctor, Kaare Nygaard, “...in admiration & thankfulness for his great hearted & generous gifts to Norwegian & Australian art” in June 1953. 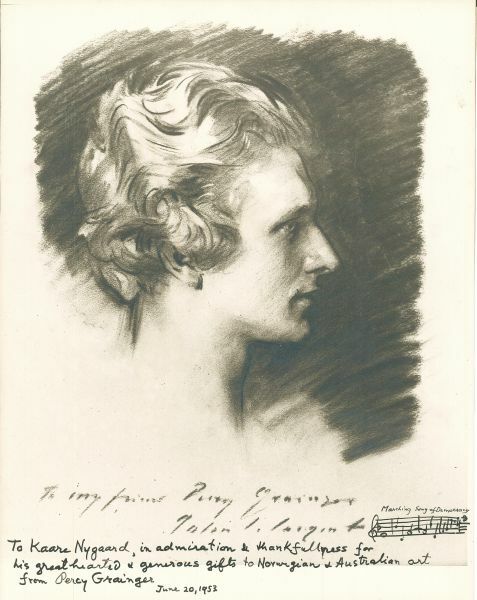 Percy Grainger donated the original charcoal portrait by Sargent to the National Gallery of Victoria in 1956 when he was in Australia for a brief period curating the Grainger Museum displays. This original portrait, on loan from NGV, will be featured in the Grainger Museum as part of the forthcoming Objects of Fame exhibition, opening in September this year. 1. Letter Percy Grainger to Karen Holten, 5 June 1907. 3. Letter Percy Grainger to Karen Holten, 25 May 1908. Image: Photographic reproduction on card of John Singer Sargent's portrait of Percy Grainger. Inscribed by Percy Grainger to Kaare Nygaard, including fragment of music “Marching Song of Democracy”, dated 20 June 1953. Photographic print and ink on card, 35 x 27.3cm. Grainger Museum Collection, 16.0001.